Cook the noodles according to the packet instructions; refresh with cold water and drain. Set aside. Heat the oil in a wok or large frying pan; throw in the mushrooms and shallots, stirring for 1–2 minutes; then add the tofu, garlic, sugar and soy sauce, tossing everything around to coat and caramelise properly. Lastly, stir in half the beansprouts, cook for 1 minute more, then take the pan off the heat. 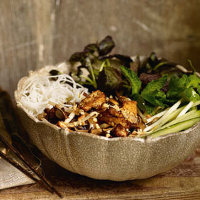 Divide the remaining beansprouts, the salad leaves and the cucumber between 4 deep bowls. Top each serving with the noodles (they will feel sticky), a few herb sprigs and some of the tofu mixture. Sprinkle with peanuts, then pour a little vegetarian dipping sauce over each noodle portion just before serving. Simply search for "Vegetarian dipping sauce" to bring up the recipe for our Vietnamese dipping sauce.